A 57 year old male was at home painting the ceiling when he fell and hit his head. He initially was lethargic and then became alert. The wife did call EMS who brought him to the ED for a check up. While in the ED, he again became drowsy. A quick neurological exam revealed mild weakness on the left side. Vital signs revealed a BP of 140/75, R 8, P 100 and T 98.5. His GCS was 9. It was decided to intubate him in the ER and send him to the ICU for further management. 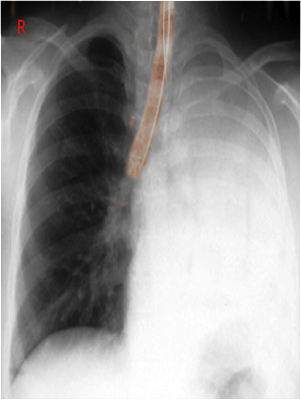 After he was intubated, a CXR was obtained, which is shown below. (XRA) A 57 year old male was at home painting the ceiling when he fell and hit his head.